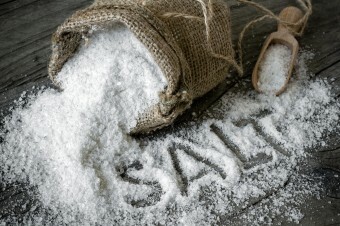 There are a lot of different salts (like potassium nitrate for gunpowder and sodium bicarbonate for baking) but only one that truly meets our dietary needs and satisfies our craving for that salty taste – sodium chloride (NaCl). Containing two elements necessary for our survival, its cultivation goes back thousands of years to the birth of civilization. In the wild, herbivores seek out salt licks. When humans ate primarily wild game, we ingested sufficient salt to meet our dietary needs; however, as our diet changed to mostly cultivated crops (read vegetables and grains), we needed to supplement salt. Human cultivation of salt is ancient, and the earliest known salt harvesting is believed to have occurred at Lake Yuncheng, in the Chinese province of Shanxi around 6000 BC. Although salt surely must have been used in a variety of ways, one of the most popular, salting fish to preserve it, appears in the records of the Xia Dynasty by about 2000 B.C. [iii] By 500 BC, the happy consequence of preserving soybeans in salt, a savory liquid that later became known as soy sauce, was discovered. It is believed the Celtic miners traded this salt across the Roman Empire and beyond, including into Britain, France, Spain, North Africa and Turkey. [xv] Other Europeans were also producing salt, including the Venetians, whose trade of salt with Constantinople made them very wealthy. Back in Africa, by the 6th century AD, south of the Sahara, “Moorish merchants routinely traded salt ounce for ounce with gold,” and in Ethiopia, salt slabs, called amoles, were used as currency. In fact, Ethiopians continued to rely on salt as a “common medium of exchange,” at least through 1935. In the intervening years, salt has played a pivotal role in the political economy of the world in a thousand different ways from starting wars to freeing people from colonial rule. Ironically, however, in the last quarter of the 20th century, salt itself was under fire, seen as a culprit that contributed to high blood pressure and the risk of stroke and heart attack. Now, the tide is turning again with recent scholarship indicating that too low of a salt intake could have adverse effects for heart patients and that the previous concerns about high-salt consumption and blood pressure may well be baseless. Despite these recent studies, the CDC still estimates that excessive salt consumption costs $20 billion each year in additional health care expenses. That said, their estimates may well be based on faulty assumptions about sodium consumption given extensive research done, particularly in the last decade, looking at the age old idea of salt and cardiac issues, finding no such connection when it comes to high-sodium intake. Again, see the sodium/blood pressure article for more details. Salt in Judaism was used or mentioned to seal lasting pacts because it does not decay itself and prevents other things from spoiling. This attribute is exactly what is needed for an eternal promise. I apologize that I cannot recall the exact source for this information.